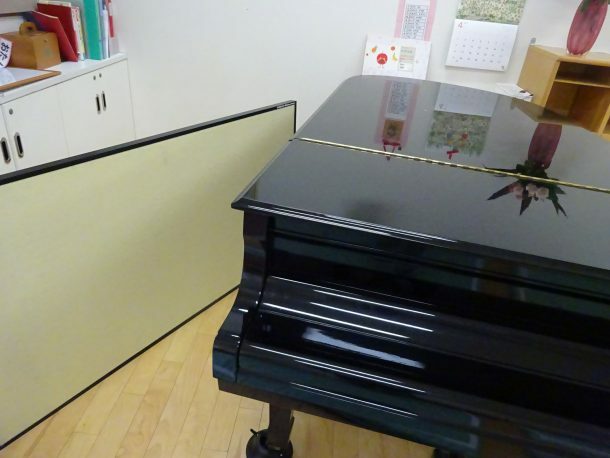 Today, I would like to introduce a case study of our acoustic panel “SHIZUKA Stillness panel(SSP)”, used for grand piano. By a request from our customer, we installed SSP near the grand piano used at school and facility. We adopted it as environment improvement of the educational site. In the case of school facilities, the floor is often made of flooring from the viewpoint of safety. However, flooring echoes when playing instruments, making it difficult for the player to hear the sound accurately, and also for listener. By installing the SSP on the wall near the piano, you can obtain a sound absorbing effect and suppress the reverberation from the wall. We used a custom-made structure in consideration of the grand piano this time. Ordinary SSP has applied aluminum fiber to the surface, we have changed the surface to felt processing so as not to damage the instrument when hitting the instrument. This felt is not a general felt, it has a humidity conditioning and deodorizing effect. Depending on the instrument, the sound quality changes with humidity, so you can change not only the sound absorption but also the environment itself of the instrument. In addition, we used wood for the material of the back, we changed the weight to be lightweight and easy to hold. Sounds can change dramatically just by slightly changing the environment of the room. We will continue to try improving the sound environment in various ways.